Our Pet Assisted Therapy teams are made up of local residents who work in pairs, with their pets, to visit healthcare facilities, drug rehab centers and correctional facilities. Pets in these teams offer the unique kind of therapy only an animal can provide. Visiting with animals helps people feel less lonely, depressed or anxious while relieving stress and encouraging a general feeling of wellbeing. Paws for Tales our Reading to Dogs program, helps children who have a difficult time reading out loud become more confident and self-assured readers. Only the most social, engaging animals and their companions become Pet Assisted Therapy teams at PHS/SPCA. Click here for our Paws for Tales schedule. If you’re interested in joining our therapy program please contact Marivic Dizon, PhD at 650-340-7022 ext. 357 or at MDizon@PHS-SPCA.org. Therapy dogs come in all sizes and breeds. The most important consideration is that your dog has a good temperament. 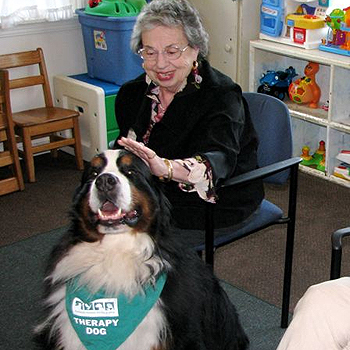 Therapy dogs must be gentle, friendly, obedient, patient, confident and at ease in all situations. 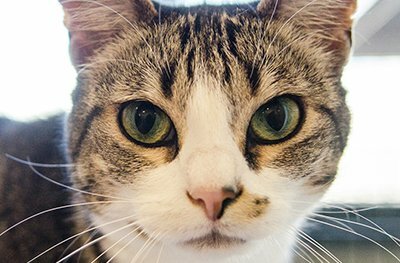 Cats, rabbits, and Guinea pigs that are gentle and not overly-stimulated are good candidates for the program. Only the most social, engaging animals and their companions become Pet Assisted Therapy teams at PHS/SPCA. Enjoy interacting with people and being touched. Show confidence in new environments. Remain calm around other animals. Have been your companion for at least six (6) months. Be a minimum of one (1) year old. PHS/SPCA offers obedience training and the Canine Good Citizen training and behavior evaluation (CGC) several times a year. As a prerequisite to the CGC, a dog must have already completed a beginner obedience training class. The animal must also pass a temperament evaluation that measures the animal’s natural or instinctive behavior. For information on the CGC, click here. 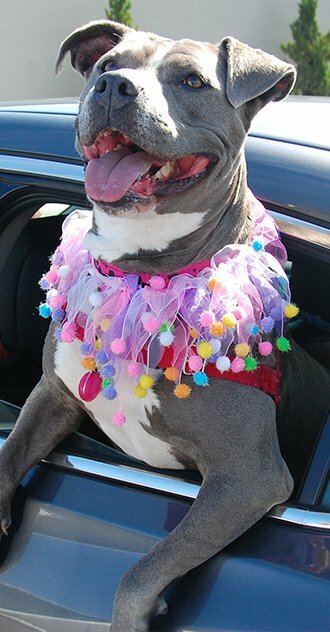 PHS/SPCA Pet Assisted Therapy program works with facilities throughout San Mateo County. We are always looking for more sites that need our special type of therapy, but we do not make home visits. To get started, please submit our Facility Request Form. We will notify you upon receipt and give you the next steps. Please note that therapy animals are not legally defined as “service” or “assistance” animals. Service animals are working dogs trained to perform specific tasks relating to their owner’s disability. 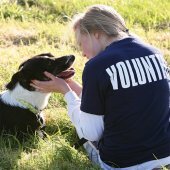 If you are interested in your animal being designated an assistance animal, please visit the San Mateo County’s website by clicking here. What are the steps to become a Therapy Animal? What is the difference between temperament and obedience training? Temperament is the animal’s natural or instinctive behavior. Obedience training is teaching an animal to follow commands while under the control of a handler. Why should Therapy Animals be temperament tested? Animals who participate in Pet Assisted Therapy are placed in potentially very stressful situations each time they work with people. It is important for the safety of all involved that animals instinctively react in a safe, predictable way during their visits. 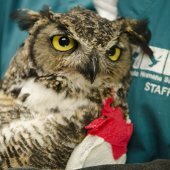 What health screening is required for Therapy Animals? A veterinarian screens for intestinal parasites, overall health and any chronic illness that might interfere with the animal performing at their best. Owners must also provide proof that all vaccinations are current and dogs, cats and rabbits must be altered. Do we certify animals for other programs? No. PHS/SPCA developed the certification process for animals who participate in its Pet Assisted Therapy. Because we provide our team members with training, liability insurance and approved facilities for them to visit, we can only certify team members who volunteer in our program. Is there a charge to participate in this program? Yes. There is a fee for the CGC training and evaluation, cost for your animal’s veterinary screening, volunteer shirt and California Department of Justice LiveScan background check submitted directly to PHS/SPCA. We are unable to accept background checks from other organizations or copies of records from other sources without exception. Are all these “hoops” and steps worth it? Absolutely! We take pride in the fact that our program is meaningful and safe. To a person, our volunteers would say the process to become involved and certified in entirely appropriate and their work is incredibly meaningful. We are always happy to share wonderful news items highlighting our good work. Please check out media coverage in the Half Moon Bay Patch, Parade Magazine and CBS News.